46 inches wide by 17.5 inches long after blocking. 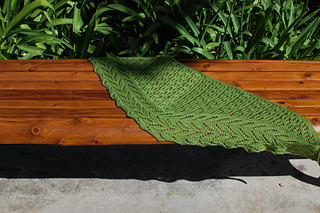 Wild Lettuce One Skein Shawl knits up quickly with only one skein of sock yarn! It uses 339 yards of new Tilli Tomas Artisan Sock and a size US 5/3.75 mm needle. 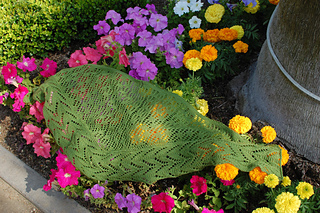 The pattern is knit as a traditional triangle, starting with a few stitches and increasing out from the center to the edge. 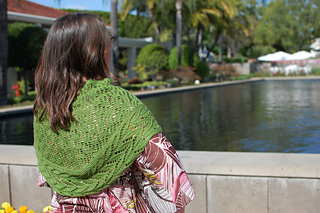 Wild Lettuce One Skein Shawl has a knit-on border which means it’s not necessary to bind off 200+ stitches at once! The bold knit-on edging is worked back and forth over 25 stitches and a k2tog with the main body stitches every other row eliminates the large bind off stitch by stitch. The pattern includes written instructions as well as charts. It has been test knit and tech edited and is presented in a clear manner. 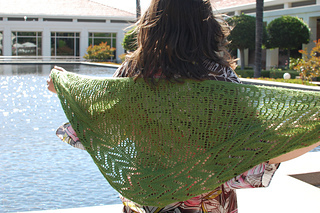 This is a beginner level lace triangle pattern. 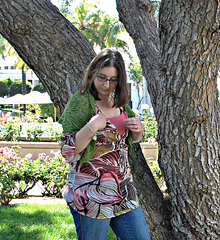 Yarn substitution may result in a change in estimated yardage, gauge and finished size of your individual project. One 100 gram ball of Tilli Tomas Artisan Sock 90% Superwash Merino, 10% Nylon. 440 yards/404 meters. Total yardage: 339 yards/ 311 meters.